administration of training / learning? is the Burning Need of the Hour? ‘Eco Changes’ represents BUSINESS OCTANE SOLUTIONS PRIVATE LIMITED stance on environmental management and the commitment to continuously strive for the greener tomorrow through cutting-edge global environment technologies and the organization’s unique strengths in manufacturing. We consider minimizing our negative impact on the environment as one of our top management priorities. Our business activities achieve this through technology and action. Supporting these efforts is a culture that encourages each BUSINESS OCTANE SOLUTIONS PRIVATE LIMITED group employee to proactively instigate positive changes and create real improvements in products, systems and services and recycling. The continuous improvement of our products and services focuses on size and weight reduction, high performance, resource saving and energy efficiency. This is the line with the corporate statement, “Changes for the Better” which result reflects our perpetual drive to actively seek out and enact improvement. ‘Eco Changes’ also represents the efforts to join forces with customers to change the global environment for the better. Our ultimate aim is to improve the quality of people’s live while making positive contributions to the environment. “Waste electrical and electronic equipment, whole or in part discarded as waste by the Consumer or bulk Consumer as well as rejects from their manufacturing, refurbishment and repair processes”. Managing of E-WASTE is most important because it consists of harmful substances which can bring adverse effects to the environment as well as human life. By scientific disposal of E-WASTE we can save our environment and also prevent its potential negative consequences on human health. E-WASTE can also be considered as a resource that contains useful material of economic benefit for recovery of plastics, iron, glass, aluminium, copper and precious metals such as silver, gold, platinum, and palladium and lead, cadmium, mercury etc. Place their request on Company Toll free number 1800-180-1818 to collect only ‘BUSINESS OCTANE SOLUTIONS PRIVATE LIMITED’ as E-WASTE and against which company shall generate & provide the request ID to Customer. The Company will not obliged and accede the request of any Customer for collection of other Companies supplier or importer of IP phones & led and interactive monitors as E-WASTE. The Company shall place the above request online to their authorized E-WASTE recycler HAYAT E-RECYCLERS PVT. LTD. to process the E-WASTE collection from Customer designated location. HAYAT E-RECYCLERS PVT. LTD. shall arrange to collect the E-WASTE from the Customer designated location through its transporter within the schedule time. After collection from specified location, HAYAT E-RECYCLERS PVT. LTD. shall store the E-WASTE at its local warehouse and consolidate all E-WASTE for dismantle at its main warehouse through a proper process & system. After dismantling, HAYAT E-RECYCLERS PVT. LTD. shall provide the certificate of Recycling & destruction to the Customer for their record. To keep high and persist the momentum of consumer for disposal of E-WASTE through proper system and further appreciate the initiatives of Consumer / Bulk Consumer to ensure environmentally sound management of E-WASTE, Company will provide a discount @ 10% on MRP as an incentive whereby respective Customer shall get a discount against purchase of ‘BUSINESS OCTANE SOLUTIONS PRIVATE LIMITED’ supplier or importer of IP phones & led and interactive monitors. )from authorized Dealers / Distributors / resellers of Company by handing over the letter received from the Company. The Discount shall be available only against purchase of one IP phones & led and interactive monitors. The Company on receipt of confirmation from E-WASTE recycler towards collection of E-WASTE from Customer location shall deliver the appreciation letter to customer with company incentive offer. Company shall deliver the discount coupon at the registered address of customer within the timeframe of 7-10 days. Customer can use this coupon and avail the discount while he / she may purchase ‘BUSINESS OCTANE SOLUTIONS PRIVATE LIMITED’ supplier or importer of IP phones & led and interactive monitors.) from Authorized Dealers / Distributors of Company and the validity of discount coupon is for a period of 3 months from the date of issue. Customer can get location/ state/ area wise list of Authorized Dealer / Distributors by visiting our website http://www.businessoctane.com/. In case the Customer intends to exchange the existing E-WASTE EEE (i.e. ‘BUSINESS OCTANE SOLUTIONS PRIVATE LIMITED’ supplier or importer of IP phones & led and interactive monitors.) of company and wish to purchase the new IP phones & led and interactive monitors, he / she may get a discount @ 10% on MRP through our Authorized Dealers / Distributors. Tell your neighbours and other persons about the hazards of improper disposal or handling or improper recycling of the Electronic Waste Don’t dispose of the discarded Electronic Equipment in household bins, Municipal Bins or mix into household waste stream. If the unwanted Electronic Equipment still work or can be repaired then consider donating them The product should not be opened by the User himself/herself, but only by authorized service personnel. Electronic equipment contains many hazardous metallic contaminants such as lead, cadmium, and beryllium and brominated flame-retardants. The improper handling and/or improper recycling of the Electronic Waste results in these hazardous metals/substances getting released into our eco and biological system, thereby leading to various health hazards. Without safe recycling, most of these toxic components will end up in land fill – poisoning the soil and water. Under the E-WASTE (Management) Rules, 2016, it is necessary for the E-WASTE to be properly channelized till the stage of its recycling and final disposal. Hence, it is imperative that the electrical and electronic equipment that are rendered useless on account of the end of its life or any accidental breakage or damage, is disposed of in a manner that is not detrimental to the conservation of the environment and does not cause any health hazard to any living beings. With a view to attain this objective, certain responsibilities have to be borne by all the concerned stakeholders including the producer, dealer, dismantler, recycler and also the consumer, involved in the production, use and disposal of the electronic equipment. Please be aware that you are a responsible consumer under the E-WASTE rules. Kindly take note of the symbol below which connotes that you should not dump any of the electrical and electronic equipment including IP phones & led and interactive monitors in garbage bins, neither should you dispose of the same through any scrap dealers. There is need to encourage recycling of all useful and valuable material from E-WASTE so as to conserve the ever depleting natural resources. Recycling end-of-life products is vital if we are to save resources and minimize waste. Oil & Gases which is present is some of E-WASTE like compressor and CRT causes environment pollution. Toxic material present in E-WASTE get mixed with earth, air, water etc and causes health issues. Burning of rubber & Plastic in open area causes air pollution. Bad impact on human being, animal, and other animates. Distributors / customers are urged to strictly adhere to the guidelines as per E-WASTE rules as any failure or contravention will attract penal action under Environment (Protection) Act 1986, which provides for imprisonment up to 5 years or with fine up to Rs. 1 Lac or both. The E-WASTE product should be handed over only to authorized recycler for disposal. In this regard, MEI has tied-up with an authorized E-WASTE recycler namely HAYAT E-RECYCLERS PVT. LTD. for facilitating our customers on PAN India Basis to enable them to dispose of E-WASTE products after its end-of-life. 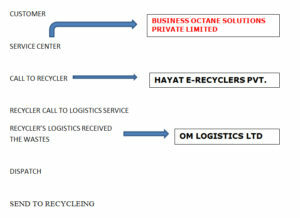 Recycler have agreement with logistics service company name is OM LOGISTICS LTD. The service is available as per conditions applicable in the respective area by recyclers. MEI reserves the right to change the terms of the recycling scheme at any time. This scheme is applicable only for collection of e-waste IP phones & led and interactive monitors. This Scheme is not generally available for Packaged IP phones & led and interactive monitors.